Dead table corals killed by bleaching on Zenith Reef, on the Northern Great Barrier Reef, November 2016. Photo Greg Torda, ARC Centre of Excellence for Coral Reef Studies. Scientists have confirmed the largest die-off of corals ever recorded on Australia’s Great Barrier Reef. 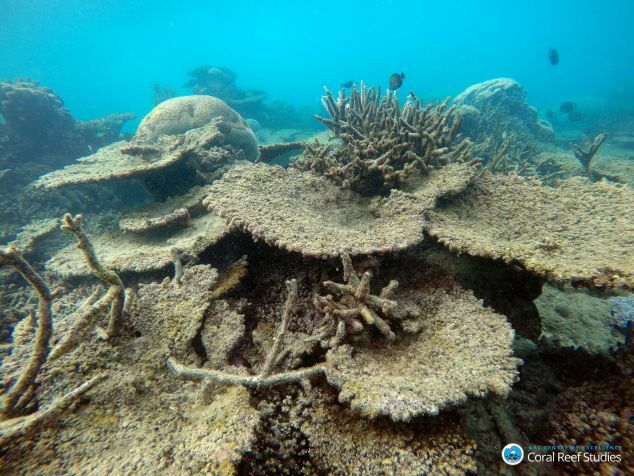 The worst affected area, a 700 km swath of reefs in the northern region of the Great Barrier Reef has lost an average of 67% of its shallow-water corals in the past 8-9 months. Further south, over the vast central and southern regions of the Great Barrier Reef, the scientists were relieved to find a much lower death toll. “Most of the losses in 2016 have occurred in the northern, most-pristine part of the Great Barrier Reef. This region escaped with minor damage in two earlier bleaching events in 1998 and 2002, but this time around it has been badly affected,” says Professor Terry Hughes, Director of the Australian Research Council (ARC) Centre of Excellence for Coral Reef Studies based at James Cook University, who undertook extensive aerial surveys at the height of the bleaching. “The good news is the southern two-thirds of the Reef has escaped with minor damage. On average, 6% of bleached corals died in the central region in 2016, and only 1% in the south. The corals have now regained their vibrant colour, and these reefs are in good condition,” says Professor Andrew Baird, also from the ARC Centre, who led teams of divers to re-survey the reefs in October and November. “This is welcome news for our tourism industry,” according to Craig Stephen, who manages one of the Great Barrier Reef’s largest live-aboard tourist operations. Tourism on the Great Barrier Reef employs 70,000 people, and generates $5 billion in income each year. Another silver lining was revealed in the northern offshore corner of the Great Barrier Reef Marine Park, where the loss of coral was lower than the other northern reefs. “We found a large corridor of reefs that escaped the most severe damage along the eastern edge of the continental shelf in the far north of the Great Barrier Reef,” says Professor Hughes. "We suspect these reefs are partially protected from heat stress by upwelling of cooler water from the Coral Sea." Scientists expect that the northern region will take at least 10-15 years to regain the lost corals, but they are concerned that a fourth bleaching event could happen sooner and interrupt the slow recovery. Please note: For a more detailed discussion about the mortality map, an article will be published in the Conversation Tuesday 29th November (http://theconversation.com/au).